Home Blog Why Pray the Divine Mercy Chaplet? Why Pray the Divine Mercy Chaplet? I used the think it was a ridiculous new fad. We had the Rosary. What more did we need? 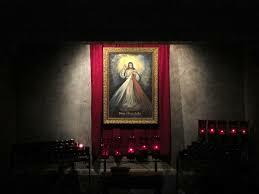 Then I read the diary of St. Faustina and prayed the Divine Mercy Chaplet for myself. My heart was changed. Learn about my Divine Mercy “conversion” here. Blessed Feast of Divine Mercy! Catholic Church, Divine Mercy, Rosary. Bookmark. thanx Marge, for your excellent Divine Mercy “conversion”, I too never heard of it til I moved here to AZ in 1989 — went to a special Mass and devotion and was hooked, seems to grow and get better every single yr, at our parish, God is definitely pouring his MERCY on each of us, were the blessed ones that recognize HIM as soooo forgiving.